Dennis Allen Mitchell was born February 20, 1966 in Havelock, NC and grew up in the Edgewood section of Winslow Township after the family moved north to New Jersey. Dennis’s father, Edward, was a marine drill sergeant. Dennis began running at the age of six when his dad didn’t feel like paying for a babysitter and took him and his twin sister, Denise, to a local track. Soon they were running for the Willingboro Track Club. The twins attended Edgewood-Winslow High School in nearby Atco, where Denise became nationally ranked in the 400 meters. She would go on to place third in the NCAA Championships at that distance. Dennis set all kinds of school and state records. He was at his best in the 400 meter (and quarter-mile), with stamina to go along with explosive sprinter’s speed. Eventually, he would make his mark in the shorter races. At age 16, he ran a 10.5 in the 100 meters. Dennis accepted a scholarship from the University of Florida, where he was honored as an All-American 12 times. He was the SEC 100 meters champions in 1985, the NCAA 500 meters indoor champion in 1986, and in 1987 was ranked in the Top 10 at several distances, winning SEC titles at 55 and 400 meters and anchoring the US 4 x 100 team that took gold at the World Championships. In 1988, Dennis took aim at the Olympics. He was second in the 100 meters at the Olympic Trials but finished 4th in Seoul. He might have won gold as a member of the 4 x 100 team, but an illegal pass between Calvin Smith and Lee McNeil in a qualifying heat disqualified the US team. Dennis finished his college career in 1989 with SEC titles in the 100 and 200. He turned pro after graduation and began training with Mike Holloway. Holloway—who would go on to coach the Gators—later called Dennis the greatest competitor with whom he had ever worked. He peaked at just the right time as a member of Team USA at the 1992 Summer Games. The year before he had been part of a record-setting 4 x 100 squad in Tokyo. In Barcelona, Dennis won a bronze medal in the 100 meters behind Linford Christie (who had edged Dennis for third in 1988) and Frankie Fredericks. He was the only American to win a medal in the 100. Dennis won another medal running the third leg of the 4 x 100—this time it was gold. He took the baton from Leroy Burrell and handed it off to Carl Lewis. They beat the Nigerians by a half-second and broke their own world record in the process with a time of 37.4 seconds. 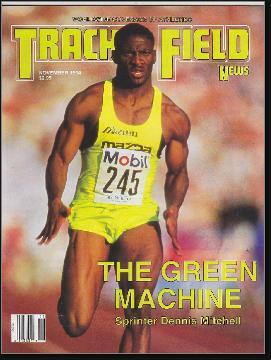 Dennis made the Olympic team again in 1996 and loudly predicted he would win gold in the 100 meters. He finished fourth. He won a silver medal anchoring the 4 x 100 team in Atlanta, with Jon Drummond, Tim Harden and Michael Marsh. They finished less than a half-second behind the Canadian team. Dennis’s last major title came in 1999 at the USA Outdoor Championships when he won the 100 meters for the fourth time in his career. By that time he was thinking about a career in coaching. He was also battling accusations that he had been blood-doping. He was eventually cleared of the charges. Dennis actually competed as a member of the 4 x 100 team at the 2001 World Championships in Edmonton, and won gold. But the medal was taken away when it was discovered one of his relay teammates was involved with the Balco scandal. Later, Dennis was called to testify against coach Trevor Graham, with whom he trained for 90 days. During that time, he allowed Graham to inject him with human growth hormones. He said it was the worst mistake of his life. Dennis married Damu Cherry, an Olympic hurdler. They had three children together. In 2005, he was inducted as a Gator Great into the University of Florida Athletic Hall of Fame. In 2009, he opened Star Athletics, a training center that hlps high school athletes attract college scholarships.